In so many ways, The Legal Genealogist is so fortunate. Not one of my direct ancestors — not a single one that I know of — fell in battle. Or died of wounds. Or even, for whatever reason, just didn’t make it home. But others in my extended family were not so fortunate. Others in my family knew, only too well, the pains of that kind of loss. The first I know of who gave “the last full measure of devotion” was Richard Baker. He was just 23 years old when he died, on a cold December day. He was unmarried. He had no children. Yet he lives on in our memories as we honor him for laying down his life for American freedom. Less than 100 years later, in that terrible fight between North and South called the Civil War, most of my mother’s family wore Confederate grey — but not all of them. Some of my Battles cousins from Cherokee County, Alabama, were loyal to the Union, and proudly donned Union blue, joining the 3rd Tennessee Cavalry in 1863. 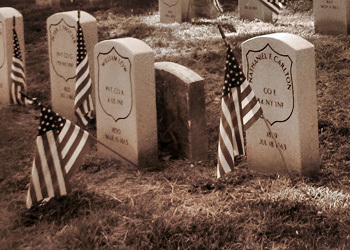 Isaac Battles and his cousins James, Russell and William F. Battles went off to war. Only Russell came home. Isaac, James and William F. Battles all perished, not in the war itself, but in the explosion and sinking of the steamer the Sultana in April 1865, with some 1700 or more other Union soldiers just freed from Confederate prisoner of war camps. Giving their last full measure of devotion. Then in the 20th century the family paid the price again, in the person of my mother’s cousin, Philip Cottrell. Three very different wars. In three very different times. And in three very different places. But three stories with the same terrible ending: three terrible tales of members of my family giving their last full measure of devotion to the nation and for the freedom we all enjoy today. I am so very grateful to them all, and honor them and all who died in the service of this country, here, on this Memorial Day 2015. Sadly, I know the costs of war all too well – having did 2 tours of duty in Iraq. After coming home from the second deployment and 3 days before I went to my last duty station, one of my brothers in arms committed suicide when he learned he was going back to Iraq a third time. I find no direct ancestors in later wars until WW II. As my mother put it, “the War really came home to us” when one of her first cousins, in the Merchant Marines, was killed when his ship, in a convoy in the Gulf of Mexico, was hit by a German submarine. To give the Germans credit, when the ship with its cargo went down, the submarine surfaced and saved as many survivors as possible, the captain among them. I was surprised to learn that the Merchant Marines and Coast Guard suffered the highest percentage of deaths of any branch of the service in that war. Both the Germans and the Japanese worked hard to cut off the source of supplies to other branches of the service by hitting the Merchant Marines. The Coast Guard was protecting our coasts from invasion, so were vulnerable.